"The Week Before Christmas And All Was Busy In The Northern Forest!" No, it wasn't Santa and his Elves, it was the dogs here at Miortuk. 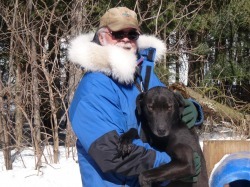 This was a very busy and exciting week here with training.We got in 5 days of training preparing the dogs for their first race in January 2015 at Val Cartier. Three runs of 8 miles, one run of 11 miles and one run of 4.5 miles. The one run was a travelling sortie were we went to my friends Valerie & Laurent Gonsolin's to train a 14 dog team on their 11 mile trail. This was a good experience for the dogs with travelling, running on a different trail and the team being evaluated by Laurent. While we were out with the Open Team, Cecile and Taisa skijored with Sam and Cosmos to give them experience travelling and running on different trails. After the run, we had a time to visit with Valerie & Laurent( without their help I wouldn't have the team of dogs I do today). It was a busy and rewarding day. We also trained again on Friday and Saturday with 8 mile runs giving Bergen experience at lead with Roxy in the Open Team. Her presence at lead set the pace for quicker runs and motivated Roxy to pickup her pace. With the change in the Open Team, we placed Teal in the 2nd team, that, it wad is training for Cecile's 6 dog racing team. Teal has always run on the right side, her preference. However, with her to run wheel with Annie ( who runs better on the right) the runs on the 19th and 20th were to reprogram Teal to run on the left. It was a challenge on the first day, but she was very good on the second run. It will take her a few more runs before she is totally comfortable on this side. Cecile returned to France on Thursday to spend Christmas with her family as she spent last Christmas here. I look foreword to her return on the 3rd of January. Taisa's family is to arrive here on the 23rd to spend the holidays here and experience the life here with Sled Dogs. Also, the training is being scheduled around a poor weather forecast with the possibility of rain for Wednesday. Lets hope the forecast is wrong and we get snow here. The trails here now are perfect! As I said, it was a busy week here in the Northern Forest at Miortuk.